One of the loveliest of the wildflowers of Britain and Ireland, Geranium pratense flowers are usually violet-blue, and sometimes a very deep blue on chalky soil,but pink and even pure white specimens are also seen occasionally. 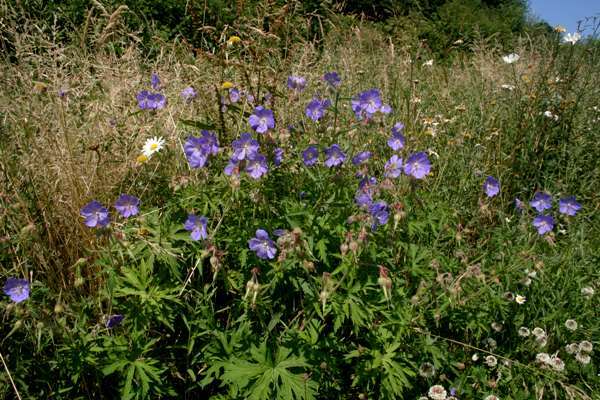 Meadow Cranesbill plants have a basal rosette of opposite long-stalked leaves above which arise several blunt-edged hairy stems branch occasionally and have short-stalked or stalkless 7- to 9-lobed palmate leaves that are deeply-cut, sharply-toothed and have pointed tips. As with other wild geraniums the stems tend to redden towards the end of the flowering season. Individual flowers are 3 to 4cm across with five unnotched petals and five short pointed hairy sepals. Each flower has ten stamens and a pistil of five fused carpels. Borne usually in pairs on axilliary flower stalks, the flowers produce five-sectioned seed capsules with beak-like tips. 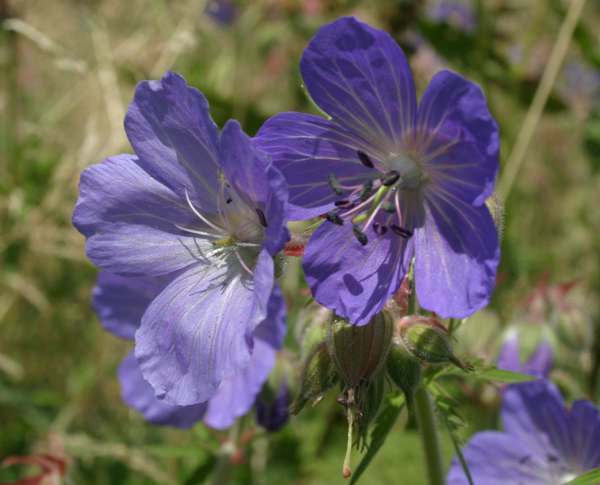 Meadow Cranesbill is found in greatest abundance in the east of andsouth of England, although it can also be found right in the north of Scotland. In Scandinavia, where this flower is widespread and common, it is called the Mid-summer Flower (Midsommar Blomster) because it can always be relied upon to be flowering in time for the Mid-summer celebrations - a far more important festival in those cold countries than Christmas! On the edges of permanent pastures, beside hedgerows and on roadside verges are the kinds of places where Meadow Cranesbill has escaped chemical herbicides and still thrives. This chalk-loving wildflower is also found on scrubby downland. 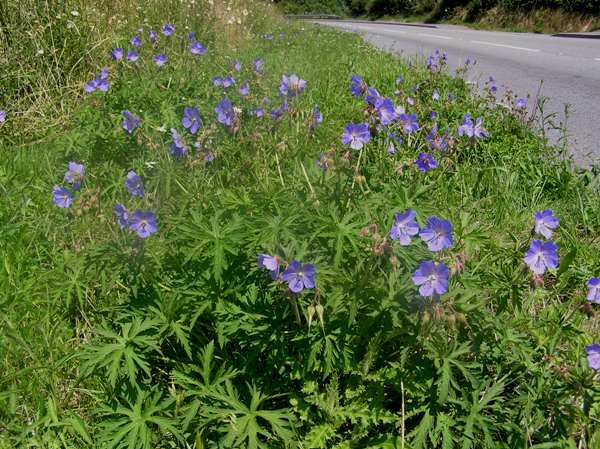 In Britain and Ireland Meadow Cranesbill flowers fromJune until September; if they have been cut down by mowers in June, plants on roadsides often produce a second flush of flowers in September. Geranium, the genus name, comes from the Greek noun geranos, meaning Crane (birds of the group of species known as the Gruidae). It is a reference to the beak-like fruit (seed capsule) which is reminiscent of the long beak of a Crane. The specific epithet pratense means of the meadow. Bloody Cranesbill Geranium sanguineum produces bright red flowers otherwise similar to those of Meadow Cranesbill. Wood Cranesbill Geranium sylvaticum is a northern species with smaller mauve flowers. 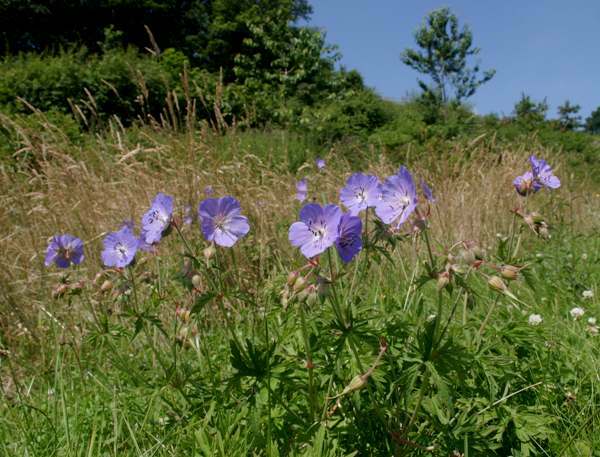 The pictures of Meadow Cranesbill shown on this page were taken in West Wales during July.